If we’re honest, we’ll likely confess that what Jesus does to the man born blind is actually quite disgusting. John reports that Jesus mixes some dirt with His saliva and rubs it on the blind man’s eyes (John 9:6). I wonder if the man’s initial response was one of disgust. I wonder if Jesus offended him. I wonder if the man’s initial response was one of doubt and scepticism. Whatever the man’s initial response was, it eventually gave way to obedience. Jesus instructs the man, “Go and wash in the Pool of Siloam” (John 9:7). The man born blind complies. John says that the man went and washed and came way seeing. I think there is an obvious analogy to the Gospel here. The apostle Paul explains to the Corinthians that to some people the Gospel is foolishness, and to others it is offensive. The Gospel describes how God takes on human flesh, lives a perfect life, and yet is arrested as a criminal and is executed upon a Roman cross. The Gospel tells us that by trusting in this God-man, and in His death, we gain salvation. To some that sounds about as plausible as healing a blind man with dirt and spit. Some hear the Gospel and are sceptical… “This sounds too easy—this sounds too good to be true.” Some hear the Gospel and are bothered by it. They are bothered by all the talk of sin and judgment. They are bothered by the notion that salvation is only possible by trusting in the gruesome death of Jesus. But, thankfully, some hear the Gospel message and believe it and, as a result, come away seeing. It is a huge deal for a man born blind to be able to see. So we’re likely not surprised to see this miracle become “the talk of the town”. And we’re probably not surprised to read that the religious leaders of the day wanted to investigate this miracle. The Pharisees ask the man how he had received his sight. I love the simplicity of the man’s reply: “He put mud on my eyes, I washed, and now I see” (John 9:15). The healing of a man born blind is massively significant. And yet, this healing is not the main point. This healing demonstrates the will and the power of God to heal spiritual blindness. It is fitting then that Jesus and this man meet up again in verse 35. The man who was healed of his physical blindness now gets healing for his spiritual blindness. 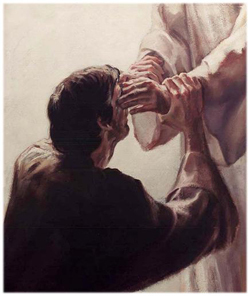 At first identification, the man born blind refers to his healer as “the man they call Jesus” (John 9:11). During their second encounter, however, the man confesses “Lord, I believe” and proceeds to worship Jesus. Permit me to draw out one final aspect from this analogy of sight. Though the man’s sight was perfectly restored, there would have been many things he would have been incapable of identifying. The man would need help comprehending what he was now seeing. He would need someone to help him to identify landmarks and the various species of animals, insects, and birds. He could see, but the work of discovery still lay ahead. Friends, if the Lord has healed your spiritual blindness, remember that the work of spiritual discovery remains. The answer: I was blind. I needed a cure for my spiritual blindness before I could see what the Bible was saying. Now, it’s also possible that you don’t regard yourself as a seeing person, but rather you regard yourself as someone looking to learn more about Jesus and His claims. It’s possible that you are cognizant of your impaired vision and you are seeking healing. And maybe the Gospel looks like the intellectual equivalent to putting mud on your eyes…. But I want to encourage you: This is how Jesus heals. God uses humble means and a simple message to initiate healing. What is left is for us to wash the mud off of our eyes—what is left is for us to believe this Gospel. Once we place our trust in Jesus, we will be able to confess with the man born blind, “I was blind, but now I see.” (John 9:25). And with new vision, the privilege of discovery awaits. I don’t imagine that this healed man continued to beg for alms at the Temple gates. I don’t imagine that he went home and sat around his living room all day. I imagine this man became engrossed in discovering what he had missed seeing all of these years. Similarly, if we are “seeing people” in the spiritual sense, we ought to be seeking to discover the beauty of Christ that we were previously missing. And so my challenge to you is to dig into the Scriptures with a view to discovering all that God is for us in Jesus. If I were to generalize I would say to you that those who go to the Scriptures with impaired vision see religion, and those who go to the Scriptures with restored sight see a relationship. Let’s engage in that relationship. Let’s go to Jesus. Let’s worship Him.